Mr. Arumainayagam presented the the CPA award to Naguleswaralingam Abiram who won the 2003 Baden Powel Award from Sri Lanka Scouts Movement. Guest of honour, UNICEF Trincomalee representative Ms Gabriela Elroy, presented a certificate and CPA award to Miss Sivanjany of Sri Shanmuga Hindu Ladies College for securing the Gold Medal for music at the national level All Ceylon Tamil Language Day competitions held in Colombo in December. Mr. Abiram has secured the Baden Powel Award for the first time in the history of eastern province and for the first time in the northeast province after twenty-three years. Mr. Arumainayagam said, "Cultural events could play a vital role in preserving our traditional cultural values. 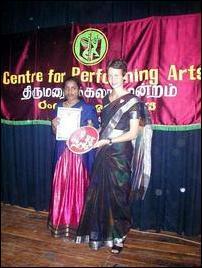 In this respect the CPA in Trincomalee works hard to preserve our traditional arts and music in the district." Ms Gabriela Elroy said, "CPA is a centre for peace and development of communication beyond borders and also a place where children and youths come together and express their views. 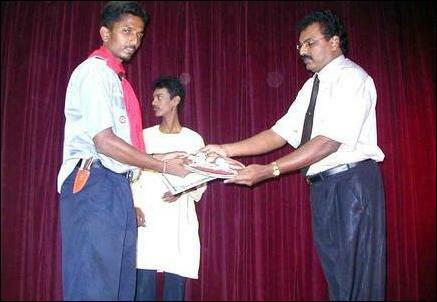 CPA plays an important role in the lives of Trincomalee youths." CPA Trincomalee co-ordinator Mr. N.T.Raguram presided the event.